This is one of my go-to summer combinations on days when it isn’t too hot out – a white embroidered top, slouchy lightweight trousers (that feel as comfortable as pajamas), a printed scarf & flat sandals. It also happens to be great vacation attire if you have a day of traveling or if you’re exploring a new city on foot & doing some window shopping. I’d love to hear in the comments below what types of outfits you’d be interested in seeing more of here on PPF (work/professional, casual day-to-day, date night, etc.) – let me know what you enjoy most & find helpful for the summer months! Such a gorgeous look! I especially love the gold bracelets! loving the classic colors and shapes of this look! Love this look! I recently bought a summer fedora for the first time and am loving it! I enjoy all the outfits you put together, I've not seen one that I haven't liked! I live in a hot and humid climate but work in a professional building where the A/C is freezing… I'd love to see more work outfits for summer. I have a tough time choosing shoes that are not the usual black pumps. 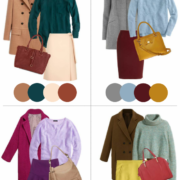 So, I'd also love some tips on how to add more color to my work outfits. Okay that bag is amazing!! Love the outfit!! Great pics! And of course, I LOVE the bag! Very cute outfit! I agree, I also like to wear light weight pants/trousers in the summer especially when it's not super hot outside. I enjoy all the looks you post but I enjoy casual day to day..
You're making me miss Summer something fierce with this look. Gorgeous! I particularly love the hat and scarf. Love the printed scarf! And the color of your bag is my favorite! 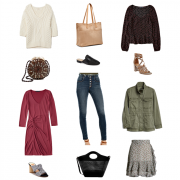 Casual and comfortable day looks that are chic but really comfortable! And toddler chasing friendly! Navy and magenta are one of my favorite color combos! Such a great laid back outfit that would be perfect for work (would prob need so add a cardi though)! Loving your outfit, it's so cute! This is the perfect summer look! I love the light layers and mixture of blues. It reminds me of the ocean! so pretty! love this casual chic vibe. the pants look so cute, and the scarf? awesome. I have so many scarves that I need to start wearing… just so hot already. Loving this look. A lot of the times my pfavorite looks are the laid back ones! OH, and I also shop in the Old Navy girls section- love it! This is so cute. I love the laid back vibe. I pulled my fedora out the other day. I totally forgot about it! I took my son to the park and realized it was all I had to protect my face from the sun. Another great outfit! 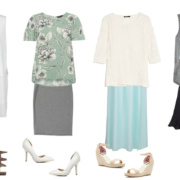 I actually like when you post your really feminine outfits – whether they be dressy or casual. I don't usually reach for very feminine pieces for myself so I like to see how you style them. Navy and white are such classic colors toghether! I love this outfit for its simplicity! Casual chic looks. BTW love the scarf! I love those pants! This is the perfect laid back summer look! Your pictures are crystal clear. Love the quality. Old Navy used to be my secret spot but now everyone has realized they really have upgraded! Love that white tank- so versatile! I love your top! I've been looking for something like that so I really appreciate you posting links to similar tops. And I'm jealous that you can wear the girl's department items! I love this laid back outfit! Your hat and scarf are adorable. 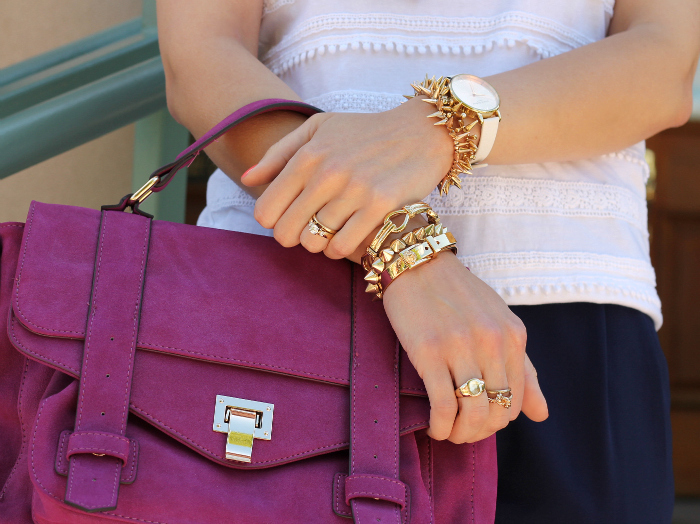 JustFab has the best bags, don't they?! Super cute look! Love this look. I am looking for some comfy summer pants like that!!! The scarf you are wearing in this post is lovely and the color of your bag is very unique, I don't see enough bright purple purses here in NYC. I would really like to see more of your day to night posts. Also, what happened to your 4-anyway posts? Those were my absolute favorite posts. Perfect outfit. Especially love those sandals and your bag. This is one of my favorites outfits too date. Chic, summery and it does look super comfortable. Thanks for the inspiration. What a great classic combo! I love the modern colors and jewelry to punch things up. I love this look! Simple, casual, but so well put together. Which is no surprise because you ALWAYS look put together. 😉 Loving the hat and your layered bracelets too. 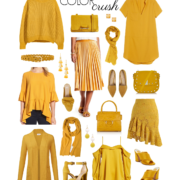 I absolutely love the bag and the pop of colour it brings to your outfit. Love those bracelets! The whole look is great, though. 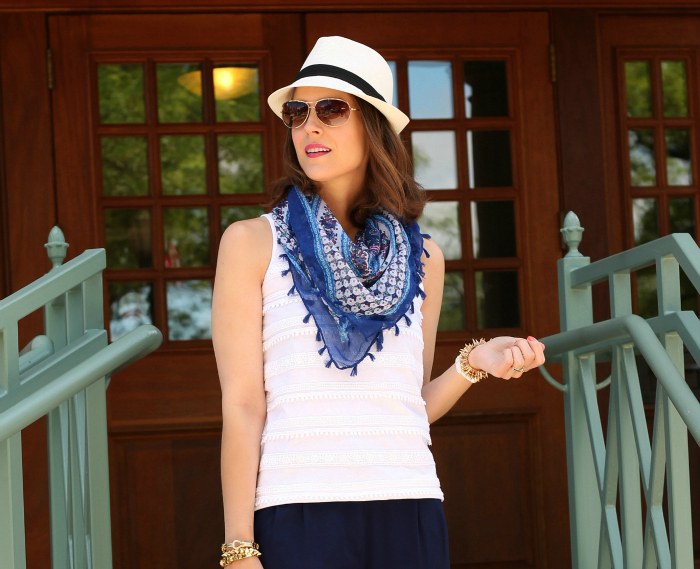 I love the detail on your simple white tank and the panama hat is such a Summer staple! I love this look! It's so pretty and effortlessly chic! Cute & comfy! Love the color of your bag. Love your fedora! Perfect piece for summer. My favorites here are the accessories. Love the hat and the shoes. Nice combo! As always, stunning look! summer celeb! Hope you are having a wonderful day! What a great relaxed look. 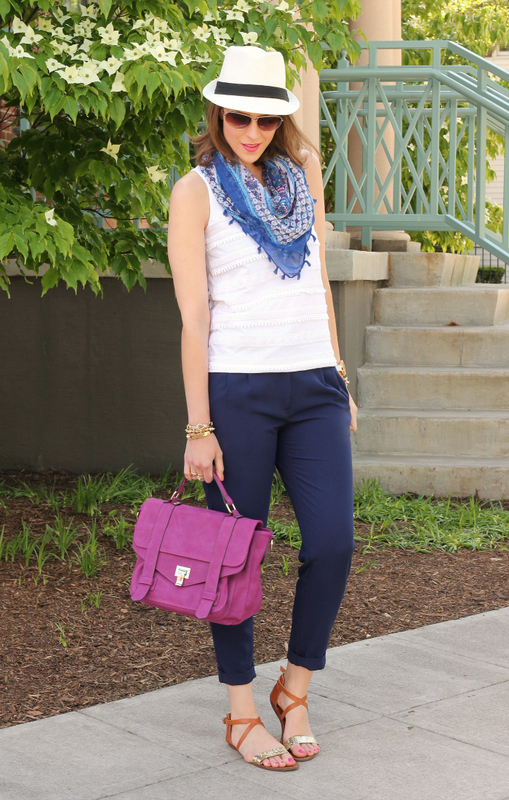 I love how your purse picks up the purple from the scarf. You look great with a fedora. This is a lovely put-together look without being over the top! One question… How did you tie your scarf? I work in a somewhat conservative office environment in the Midwest, with a "business casual" dress code. I'd love to see outfits for this environment. I LOVE this outfit! I have been looking for a pretty pink bag for a while now and I think this may be the cutest one I've seen so far. with my mind on my money and my money on my mind. Sorry that's just where my mind went when I saw the title! I really adore the fedora. I didn't read the previous comments so maybe someone else already said this…but my biggest problem in the summer is that I get chilly in an office all day, but then I go outside and it's sweltering. I'm always looking for creative layering ideas! (especially light layers) Keep up the good work, Kim! I have been looking for a white fedora…thanks for posting this one! that tank is old navy?! you have such a good eye!